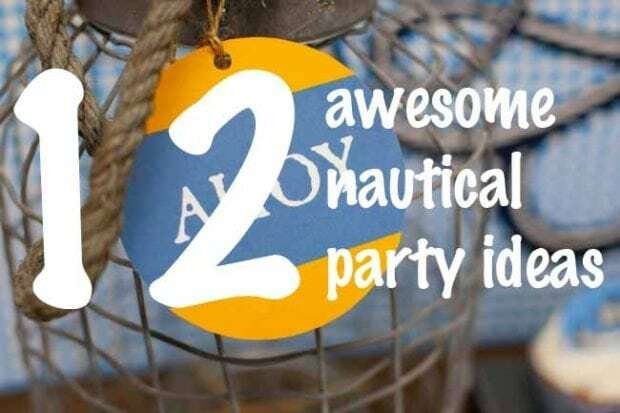 Say Ahoy to 1 year with this adorable Nautical Themed 1st birthday party for a little boy. Kristin, over at Paige Simple, celebrated Chase’s first birthday with a Red, White and Blue seafaring party that was full of small nautical details and big ideas. She invited everyone “aboard” with a “Welcome Aboard” wreath — simply made to look like a life preserver — which also served as the backdrop for her main display table. Be enchanted by this Beautifully Rustic Nautical-Themed 2nd Birthday Party. Land ho! I see a A Nautical Ahoy Baby Shower not too far away! Once inside, the snack table was brimming with adorable treats and even some healthy snacks. It’s always a good idea to set out at least a few “in season” fruits, like the blueberries Kristin set out in cute little matching paper cups. But don’t worry there were plenty of sweet treats with whale cookies, marshmallow pops, caramel popcorn and of course Swedish Fish! 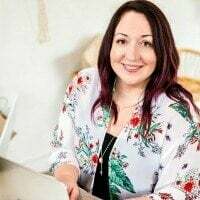 The theme is carried over to the paper goods with cute paper straws with “Ahoy” flags, and coordinating plates, napkins and cups, all with matching labels. The party decorations had an airy feel with lots of pinwheels and party hats in coordinating colors, all made from digital patterns she found on Etsy. Kristin paid such attention to the little things that she didn’t just decorate the birthday boy’s high chair, but also added a red pop of color to the rest of the guests’ chairs to bring the theme outside. She also used red metal pails, in various sizes, both on the snack table as well as in the centerpieces on the outdoor tables. When you are hosting a birthday party that will not all be in one room, it’s important to make sure your theme flows between the rooms. At a lot of parties it’s the small things that people notice the most, all those things that are beyond the cake and balloons.